An Atlantic torpedo ray photographed at Folly Cove, Cape Ann, Massachusetts. Atlantic torpedo rays aren’t your usual, charismatic touristy rays, like mantas, spotted eagles or even southern stingrays. In a way, they’re more interesting. It’s not for nothing that members of the family Torpedinidae are called electric rays. 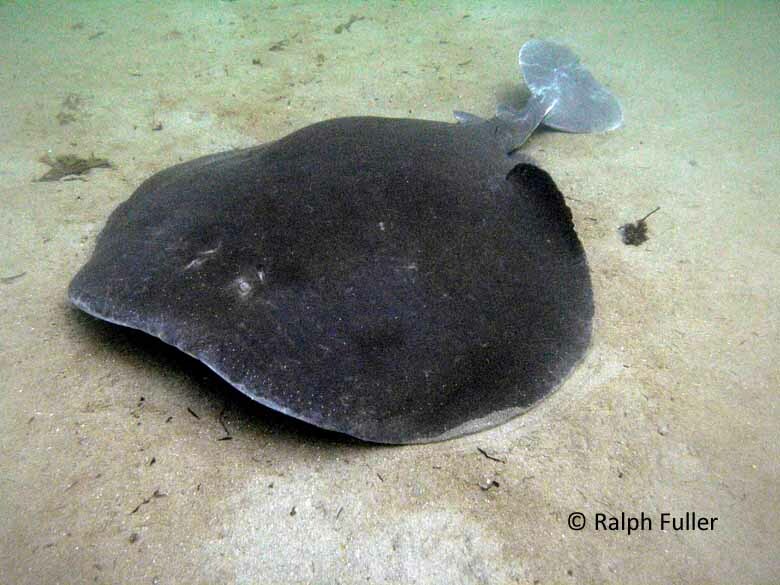 The Atlantic torpedo (Torpedo nobiliana) is one of 14 species of Torpedinidae rays worldwide that can deliver an electric shock – most producing less than 80 volts. T. nobiliana delivers up to 220-volts – probably not enough to kill humans, but enough of a wallop to stun them. An anomaly of T. nobiliana is that information sources about them are plentiful and the information contained in them is contradictory and confusing. Most sources consider them benthic, or bottom-dwelling – but some call them semi-pelagic (free-swimming). That may be because they’re known live along the continental shelf, going to great depths (350 or 3,300 feet, take your pick). But they’re also found in shallow waters, usually on sandy or muddy bottoms – but that may be mostly just the juveniles. An 1882 drawing depicting the electrical apparatus of an Atlantic torpedo ray. Drawing: A public domain illustration through Wikipedia Commons. Atlantic torpedoes are found in western Atlantic waters stretching from Nova Scotia to North Carolina, unless they really range to the Florida Keys. And maybe the Gulf of Mexico (or maybe not). They definitely are found in the eastern Atlantic, from Scotland to about halfway down the west coast of Africa – and throughout the Mediterranean Sea. And maybe, by one source with a cool map, in the Caribbean and as far south as Brazil. Humann’s reliable Florida/Caribbean/Bahamas Reef Fish Identification field guide doesn’t mention them as being there. Peterson’s Atlantic Coast Fishes puts their range as Nova Scotia to North Carolina and possibly Florida (but doubtful in Cuba), with the only other Atlantic electric ray, the lesser electric ray (Narcine brasiliensis) found as far south as northern Argentina. Lesser electric rays are much smaller – about 18 inches in diameter – and discharge a measly 14 to 37 volts. 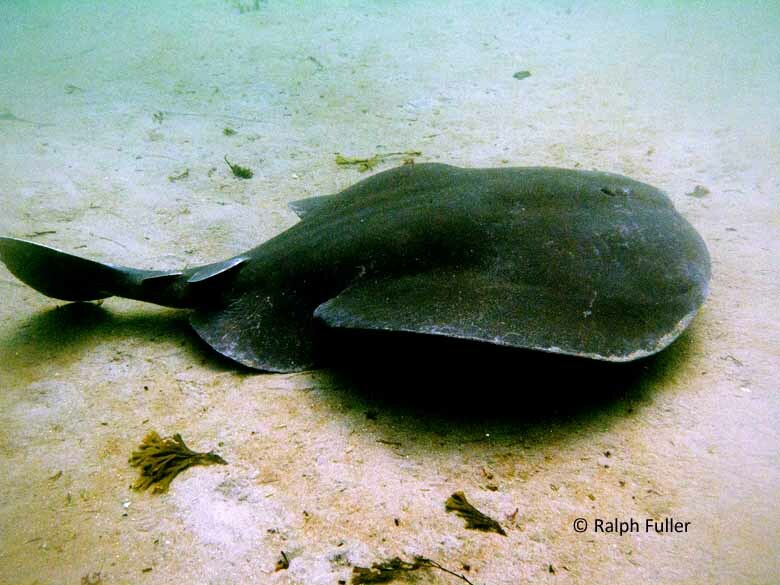 Like all rays, Atlantic torpedoes are cartilaginous fishes with broad, flattened pectoral fins that give them the look of disc-shaped bodies trailed by tapering tails. Atlantic torpedoes actually have much more circular bodies than other rays. Dark gray or brown on their dorsal sides and white underneath, they’re among the largest rays – adults can reach about six feet. They tend to be sluggish unaggressive animals that often bury themselves in the sand or muddy sediments during the day and forage at night. Unlike most rays (possibly, mixed signals, again) they swim not with their “wings” but with their tails, which can make them slow movers. Sluggish or not, they’re successful “ambush predators,” striking quickly to stun or kill prey with electric charges generated by stacks of striated muscles located on each side of their heads. They produce current their charges by contracting those kidney-shaped muscle banks. With jaws that can be significantly extended, they feed on surprisingly large prey, including flounders, mullets, mackerels – and small sharks. In the mixed signals category, they may also forage for mussels and crustaceans buried in the bottom sediments like many other ray species. Atlantic torpedoes (and all other members of family Torpedinidae) are ovoviviparous – their embryos develop within the mother’s uterus, sustained first by egg yolk, then by “uterine milk.” After about a year of gestation, some 60 little T. nobiliana are born live, each about eight inches long and capable of using their electric powers for good or evil. The torpedo ray’s electrical capabilities were reportedly utilized by ancient physicians for medical treatments, and the term ”torpedo” comes from the Latin word for numbness, reflecting an electrical shock’s effect. From there the word migrated to cover ocean-based explosive devices, first in the form of underwater mines, then our contemporary word for undersea missiles. Before kerosene was introduced in the 19th Century, the liver oil of Atlantic torpedoes was prized as a fuel for lamps. Today, the animal is considered to have no commercial value. Information on Atlantic torpedoes is so skimpy because fishes with little financial value are often discarded at sea when caught as bycatches. Principal Sources: Peterson’s Field Guide to the Atlantic Seashore, Kenneth L. Gosner; Reef Fish Identification Florida, Caribbean, Bahamas, Paul Humann, Ned DeLoach; Encyclopedia of Fishes, John Paxton and William Eschmeyer; Florida Museum of Natural History, www.flmnh.ufl.edu; The Shark Trust, www.sharktrust.org; International Union for Conservation of Nature, http://www.iucn.org; Centre for Marine Biodiversity, http://www.marinebiodiversity.ca/; National Oceanic and Atmospheric Administration, www.noaa.gov.